Cancers, malaria, infection virale, maladie d’Alzheimer, arthrite… Le potentiel de l’océan pour produire de nouveaux médicaments afin de traiter ces maladies n’a jamais offert autant de possibilités. 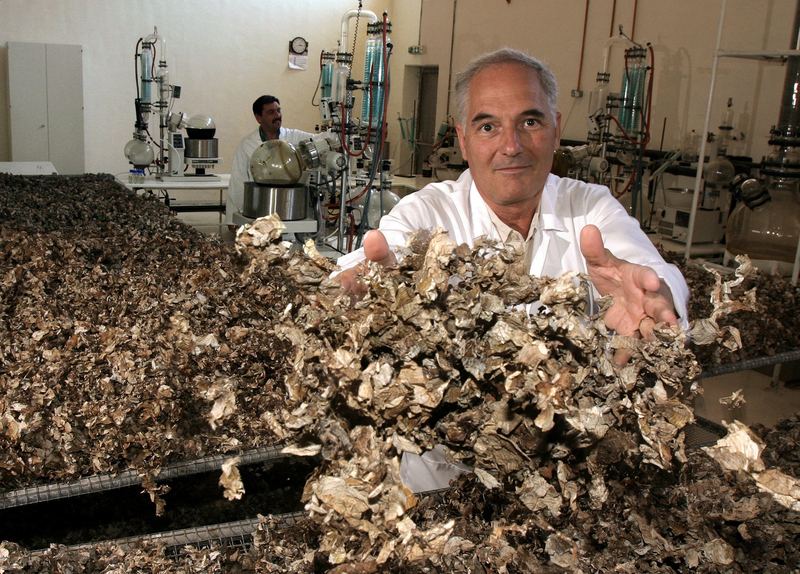 La faune et la flore marines contiennent des secrets biochimiques qui peuvent aider à comprendre les maladies et à la production de traitements. Les bactéries des grandes profondeurs contiennent des nouvelles molécules exploitables pour la biomédecine ou la biotechnologie. Les recherches montrent que le potentiel pharmaceutique des organismes marins peut dépasser le potentiel terrestre actuel. Brest.France.May 2005. At SEADEV lab a reaserch microbiologist working on the optimisation of marine microorganisms in a steril chamber. Dr William FENICAL, Professor of Oceanography holding a molecular model of a new anticancer agent produced by deep ocean bacteria : the marinomycin A. Marinomycin A is a potent inhibitor of cancer cell growth and shows an impressive selectivity toward melanoma. 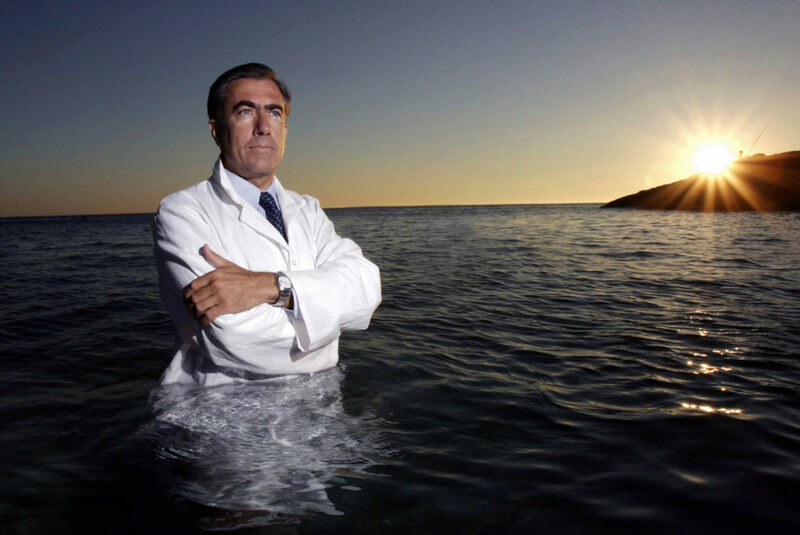 This picture was done near the University of California, in San Diego in la Jolla, (USA) where William FENICAL is Director of the Center for Marine Biotechnology and Biomedicine (CMBB). 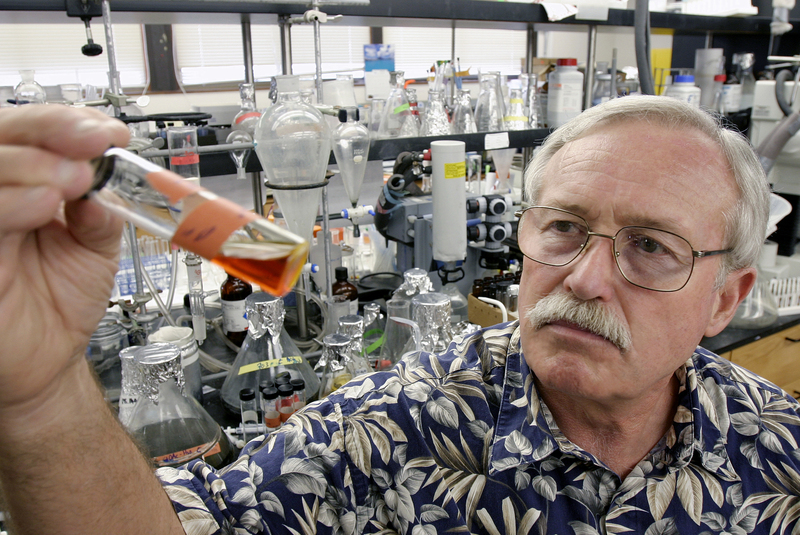 Dr William Fenical, Professor of Oceanography, Director for the Center for Marine Biotechnology and Biomedecine, in his laboratory at the SRIPPS institution in La Lolla, San Diego, USA. W.FENICAL holding chemical sediment in a tube. 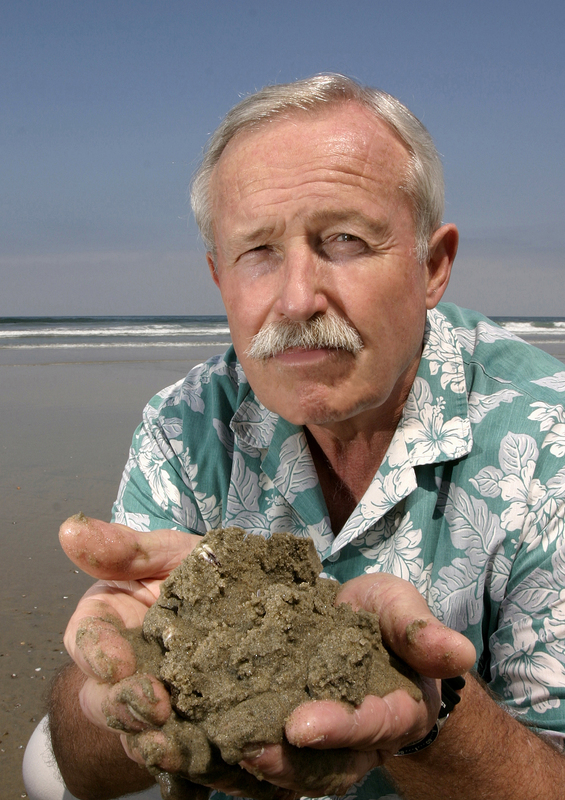 Dr William FENICAL, Professor of Oceanography with a sand/mud sample from the coast of La Jolla in San Diego in the USA . The idea is to indicate how promising the new actinomycete bacteria from this source. More than 13 new genera of these bacteria have been found in marine muds, strongly indicating a huge diversity of new antibiotics and anti-tumor drugs can be developed. 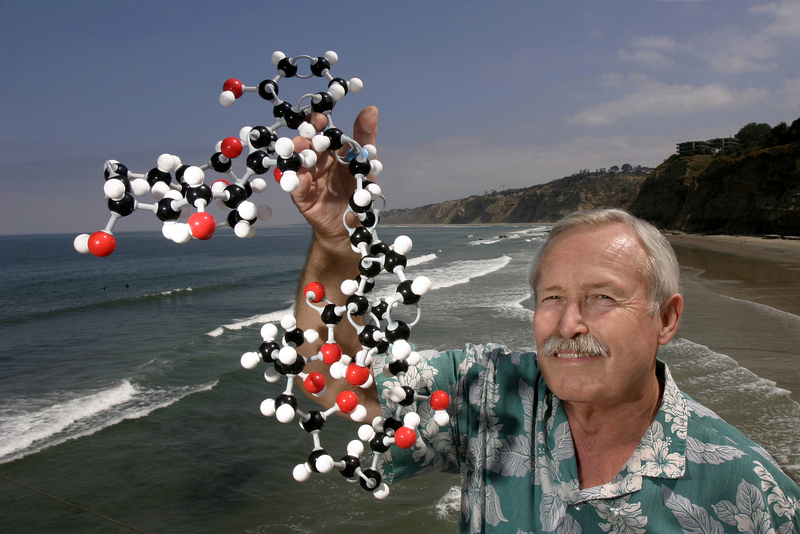 William FENICAL is Director of the Center for Marine Biotechnology and Biomedicine (CMBB). at the SCRIPPS institution of Oceanography. At The Center for Marine Biotechnology and Biomedecine at the SCRIPPS Institution in San Diego (USA), a scientist working in laboratory to extract the sequence of genomic DNA of actinomycete cells. At the SCRIPPS Institution of Oceanography in San Diego (USA). 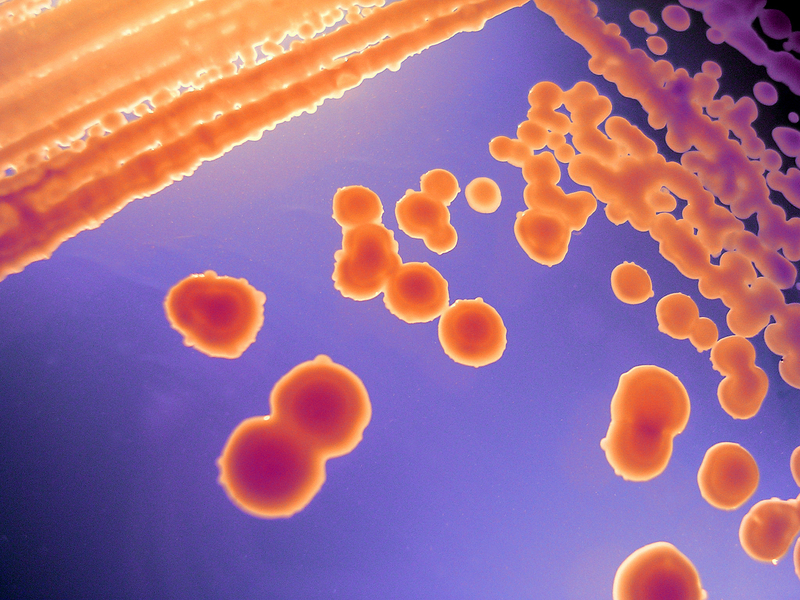 Photo of unicellular actinomycete growing on agar media. It is a new genus of bacteria. It was isolated from marine sediment collected during a research expedition in the Republic of Palau in Pacific. 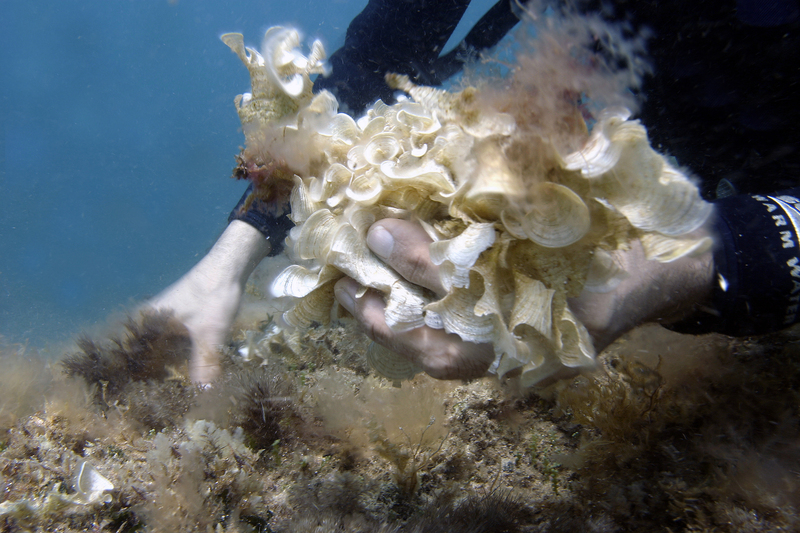 The marine derived actinomycete is most closely related to Microccus luteus. These strains were only recently isolated from marine sediments and are currently having their chemical diversity studied. In addition to looking for never before seen chemical compounds,, scientists are also testing to see whether the strains produce chemical compounds that have anti-cancer, antibiotic and/or anti-fungal properties. Photo of a scanning electron microscopy (SEM) image of a crevice in a sand grain, collected from the coast of la Jolla, in San Diego (USA). The object present in the crevise is likely a sponge spicule; magnification 8000X. At the SCRIPPS institution of Oceanography in San Diego (USA) Photo of a unicellular actinomycete growing on agar media. 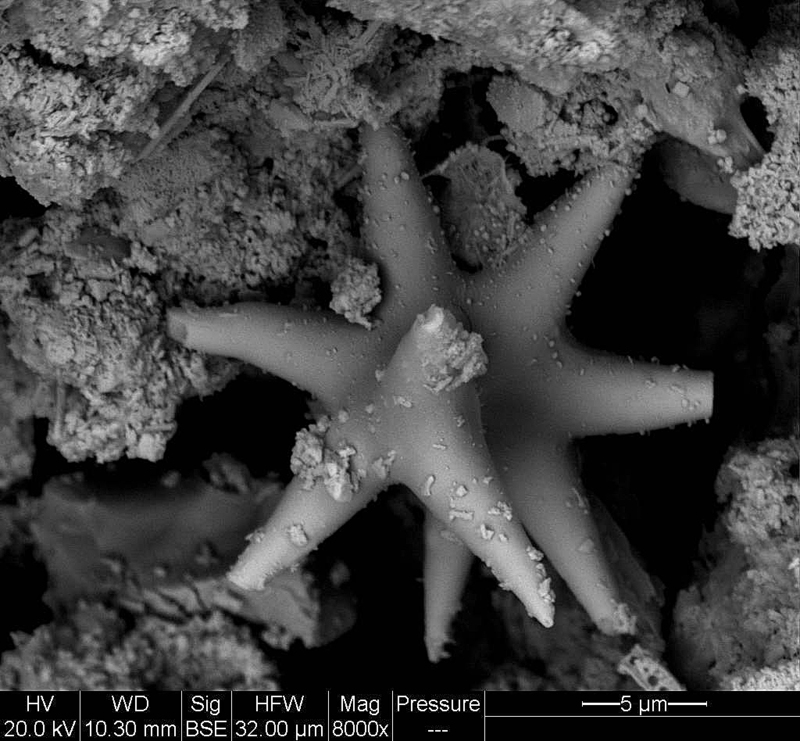 The actinomycete was isolated from marine sediment collected during a research expedition in the Bahamas. The marine derived actinomycete is most closely related to Tsukamurella sq. magnification 32X. These strains were only recently isolated from marine sediments and are currently having their chemical diversity studied. In addition to looking for never before seen chemical compounds,, scientists are also testing to see whether the strains produce chemical compounds that have anti-cancer, antibiotic and/or anti-fungal properties. À la fois anti-inflammatoire et antioxydante 2, le cartilage de requin soulage les douleurs arthritiques 3 : arthrose, arthrite, polyarthrite, etc. Malta. June 2005. 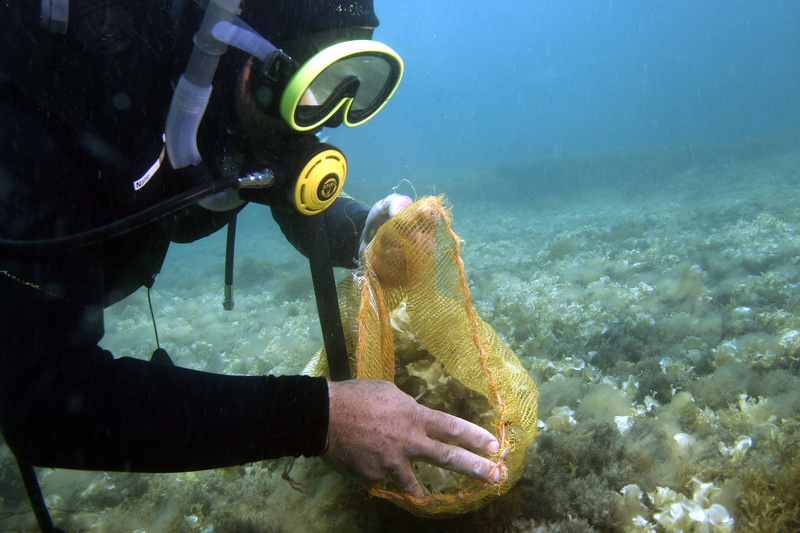 A diver from the Institute of Cellular Pharmacology (ICP) is taking the algae called « Padina pavonica » in Malta at 20 feet deep. The « Maltanedienol » named in honour of the Maltese nation is a new hope for treatments on osteoporosis and arthritis. At the SCRIPPS Institution of Oceanography in San Diego (USA). 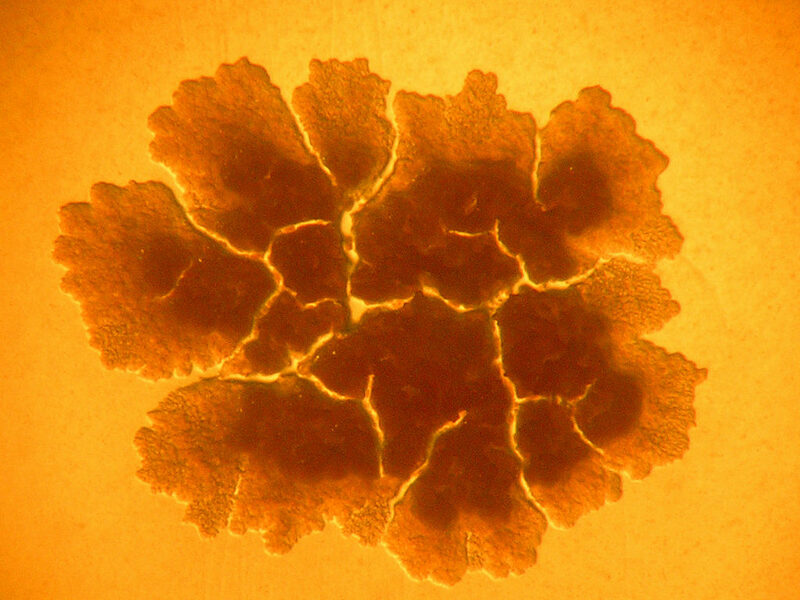 Photo of five distinct filamentous actinomycetes isolated from marine sediment collected during a rtesearch expedition in the Republic of Palau in Pacific. 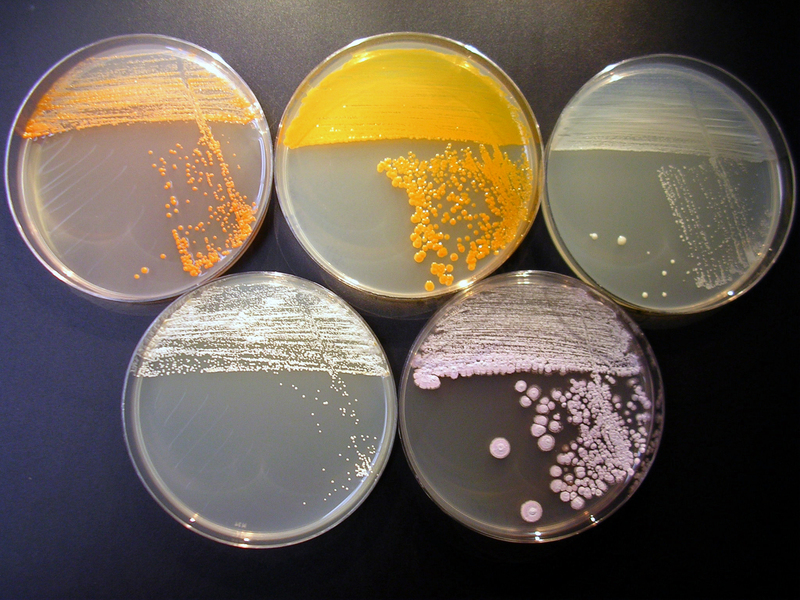 Thes filamentous have been exploited as a major resource of novel antibiotics. Malta.June 2005. 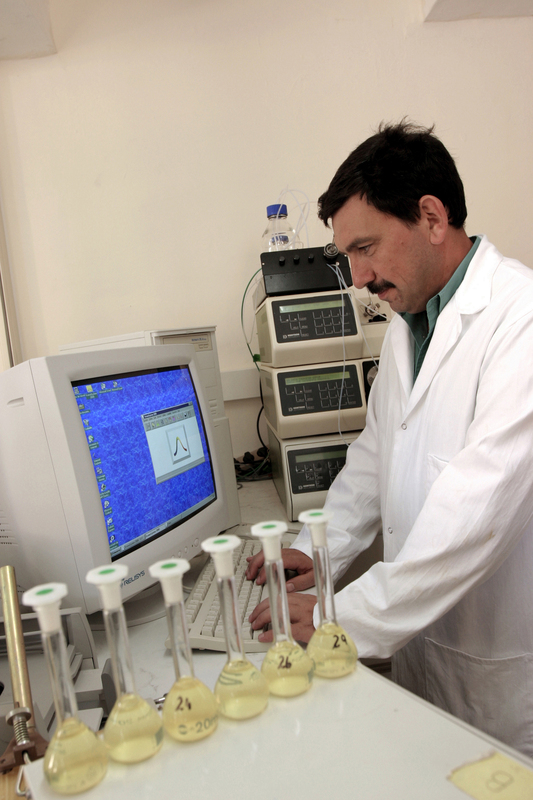 Picture of Dr Gilles Gutierrez, Pharmacologyst and Prsident of ICP (Institute of Cellular Pharmacology) holding the alga called ÔPadina pavonicaÕ at ICP lab. Clinical studies have been carried out in conjunction with the University of Malta to demonstrate its effects. Dr Gutierrez : « The clinical results show that this newly discovered molecule has a huge potential for regenerating bone and skin loss associated with age, including osteoporosis and arthritis. 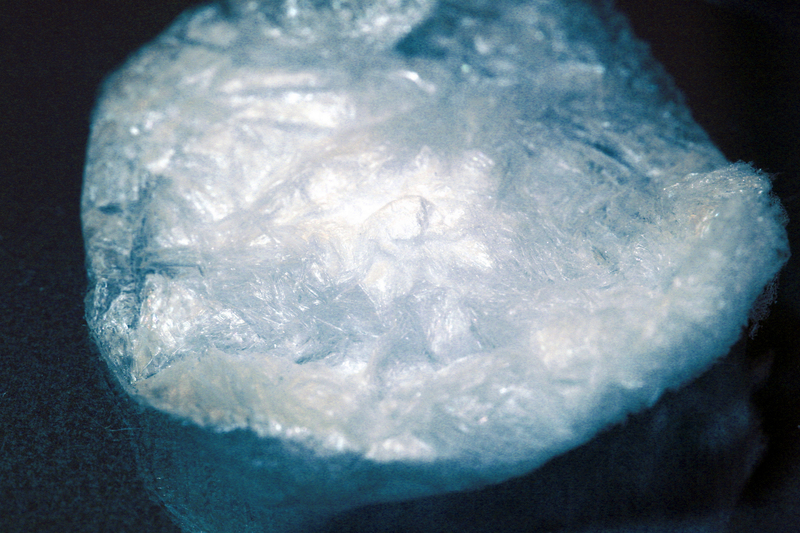 » This molecule was discovered in the algae called « Padina pavonica ». It is a new core symmetrical structure linked with the steroid family. ICP and the French research institute Texinfine have now established a joint research facility and production unit to produce the molecule on an industrial scale, for pharmatceutical and nutritional products to help with the regeneration of bone and skin. Malta. June 2005. Harvest from the sea. 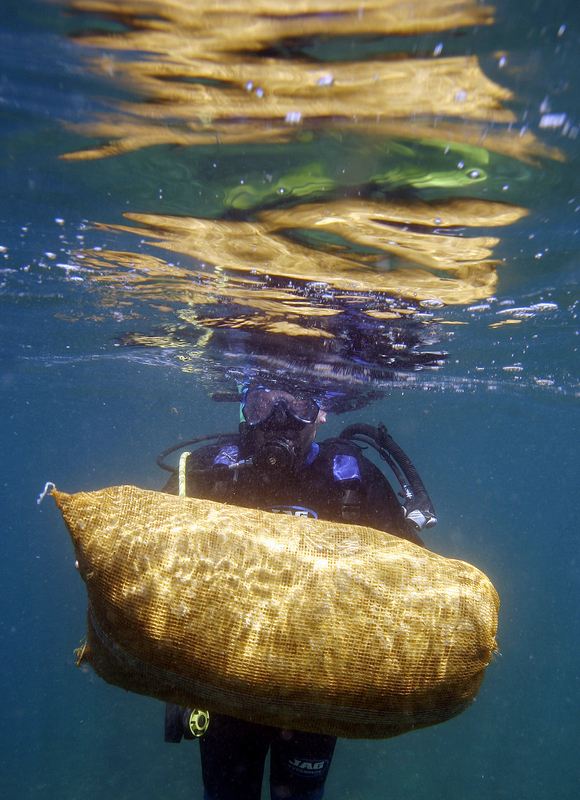 A diver from the Institute of Cellular Pharmacology (ICP) is taking the algae called « Padina pavonica » in a bag near the surface. 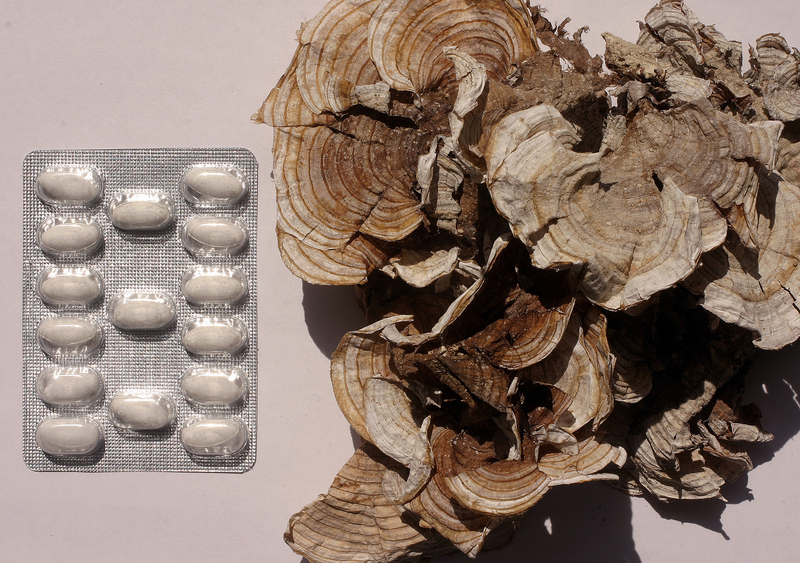 The « Maltanedienol » named in honour of the Maltese nation is a new hope for treatments on osteoporosis and arthritis. Malta.June 2005. Picture of Dr Charles M. Saliba, Chimist, at the Institute of Cellular Pharmacology working on ÔPadina pavonicaÕ at ICP lab. In the Philippines, Dr W. FENICAL discovered the jellylike animal – called « Diazona angulata » containing diazonamine A. W. FENICAL chose to test the compounds again a certain type of colon cancer. « It’s one of the more difficult cancer cells to kill » he says. 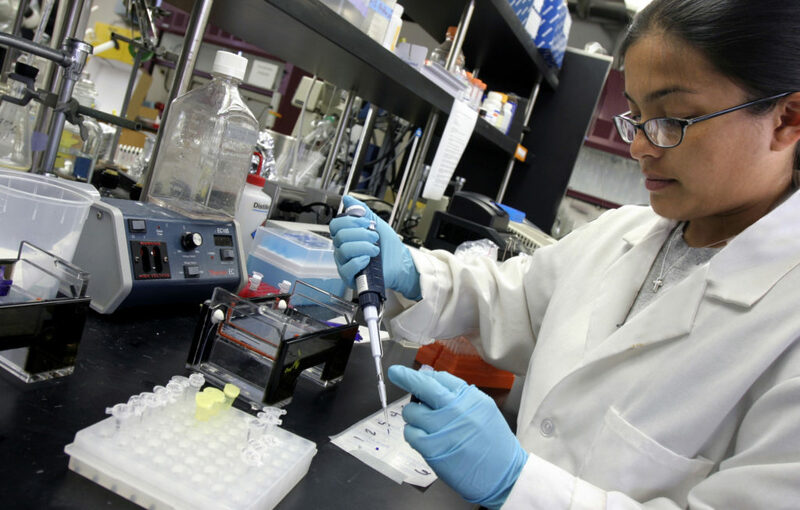 The experiments revealed that diazonamine A killed the colon cancer cells. Brest. France.May 2005. At SEADEV lab, picture of a new substance, the exopolysaccharide produce by marine microorganisms tested for anti-inflammatory diseases in oral hygiene. 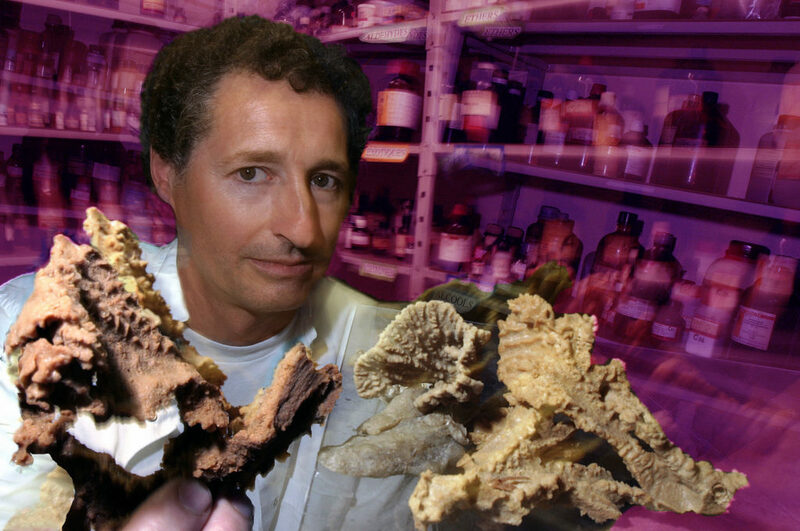 Bernar BANAIGS, from INSERM ( National Institute for medical research) in France, showing a sponge collection in the chemical laboratory at the University of Perpignan.The expertise of the laboratory is in the field of Marine Natural Products Chemistry, the study of compounds produced by marine plants and animals. 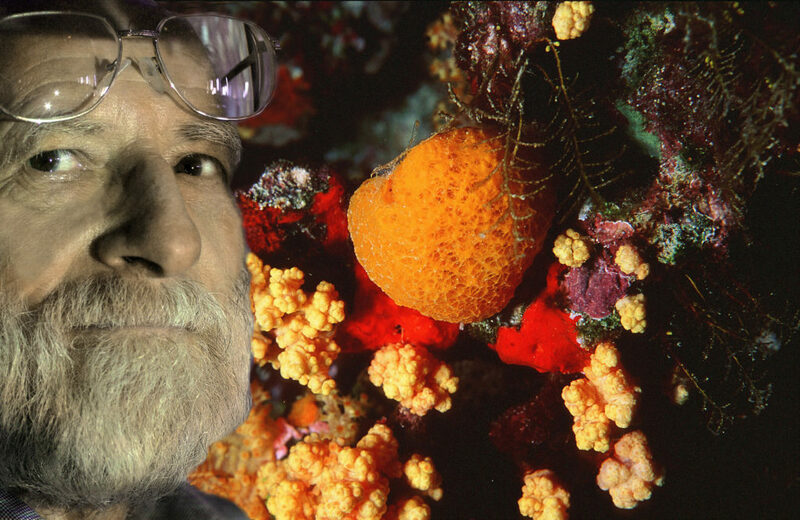 Bernard Banaigs : » Our interest lies in two main areas: – marine chemical ecology. The principal aim of this work is to understand why marine organisms produce such a wide array of interesting chemistry. – and marine pharmacology. 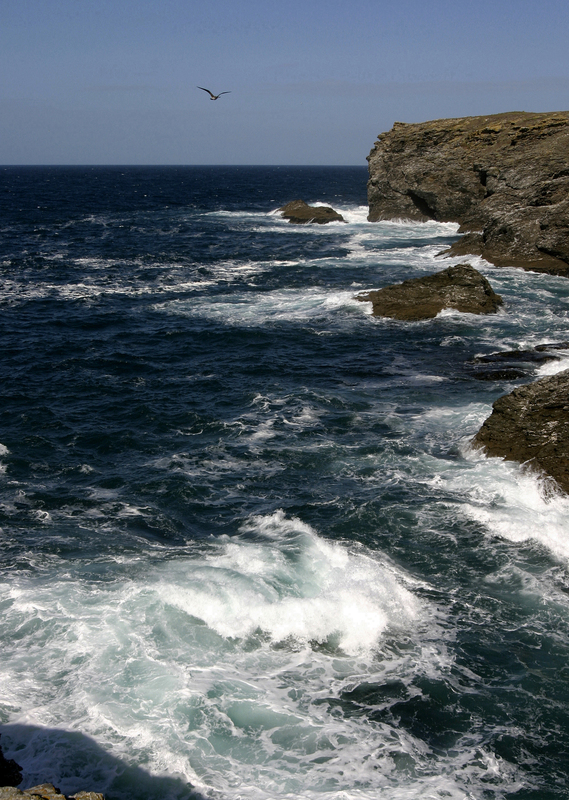 We are interested in the discovery of new pharmaceuticals from marine organisms ». Marseille. France.July 2005. Portrait of Dr Jean Vacelet, Professor at the University of Marseille. He is a sponge specialist and working in the fundamental research. 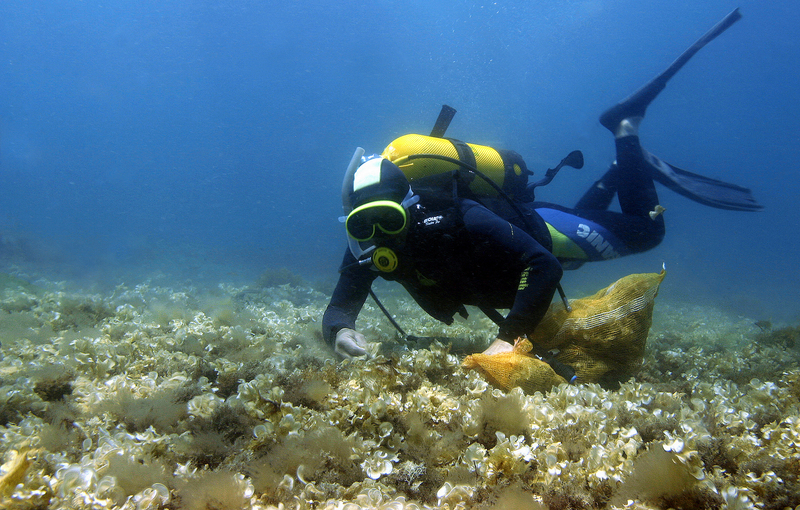 He discovered more than 150 species of sponge. The scientists have identified molecules which, in vitro, can prevent proteins vital to the parasite of Malaria from functionning. They come from marine sponge. 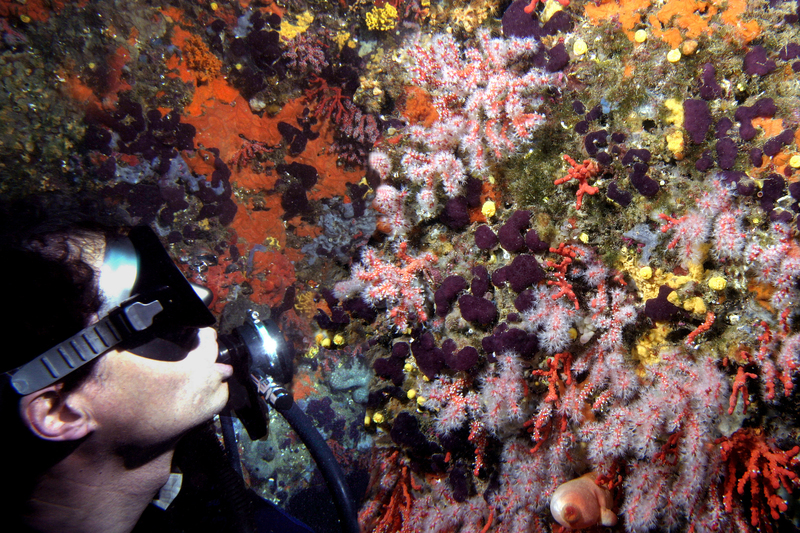 In the back, photo of a sponge- alcyonnaires. 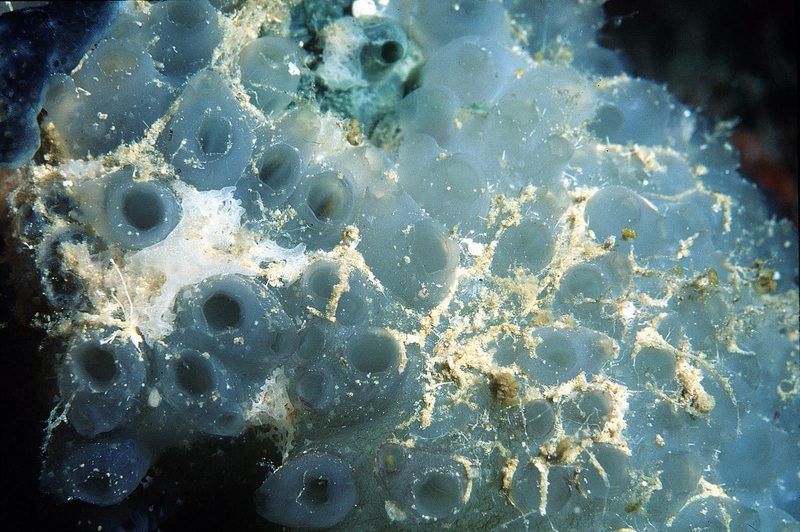 Sponges, often plagued by parasitical bacteria, produce defensive chemical substances. Here, an anti-herpes molecule, and anti-leukemic. 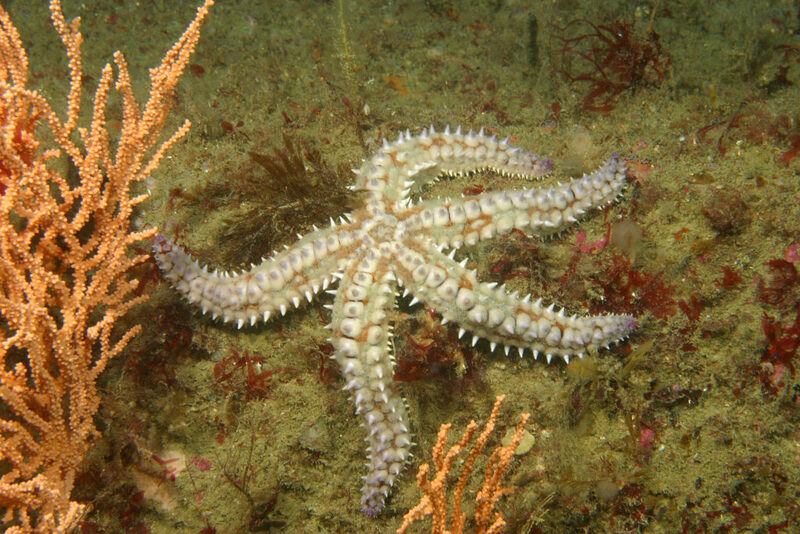 The spiny starfish (Marthasterias Glacialis) living in the English ChannelÕs waters produces a surprising molecule against cancer. It was Dr. Laurent Meijer of CNRS of Roscof, France who discovered the ÒRoscovotineÓ. ItÕs a molecule used against breast and lung cancers. Therapeutic tests are underway. In blocking cancerous cells without affecting healthy ones, the ÒRoscovotine is a new potential chemical therapeutic weapon against cancer. Bernard BANAIGS, from INSERM ( National Institute for medical research) in France, watching typical invertebrate community of the Mediterranean sea in Spain. 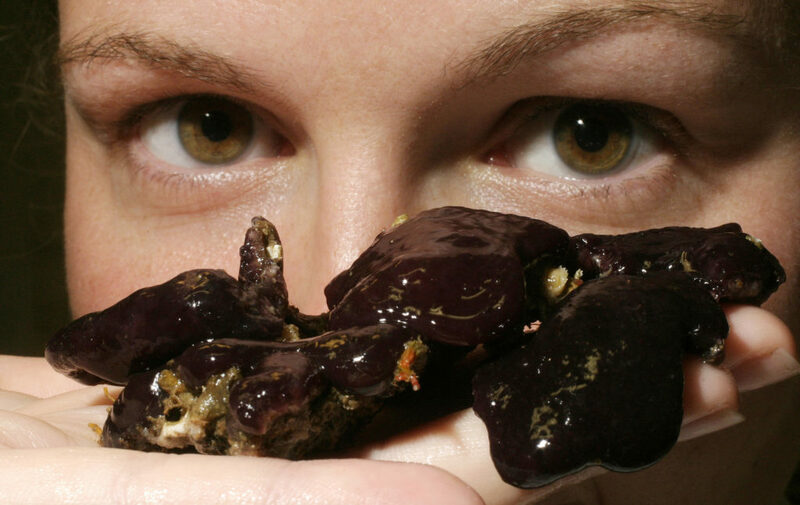 B.Banaigs: » Our interest lies in two main areas: – marine chemical ecology. The principal aim of this work is to understand why marine organisms produce such a wide array of interesting chemistry. – and marine pharmacology. 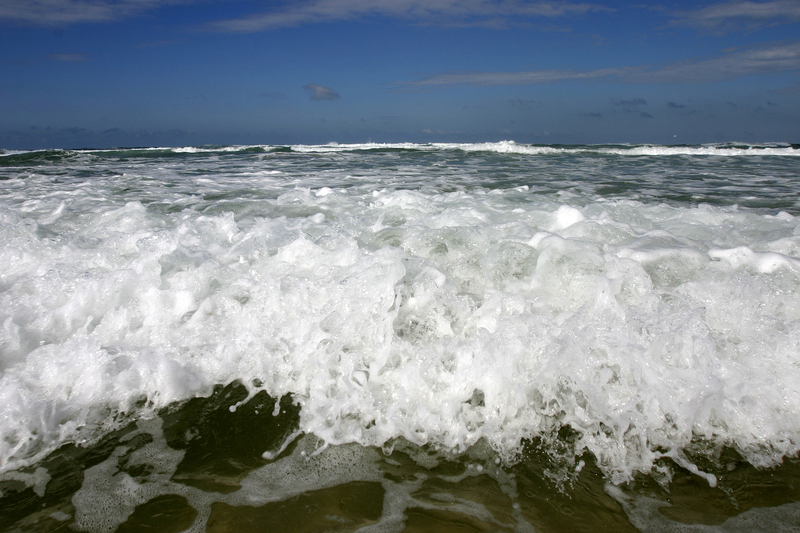 We are interested in the discovery of new pharmaceuticals from marine organisms ». 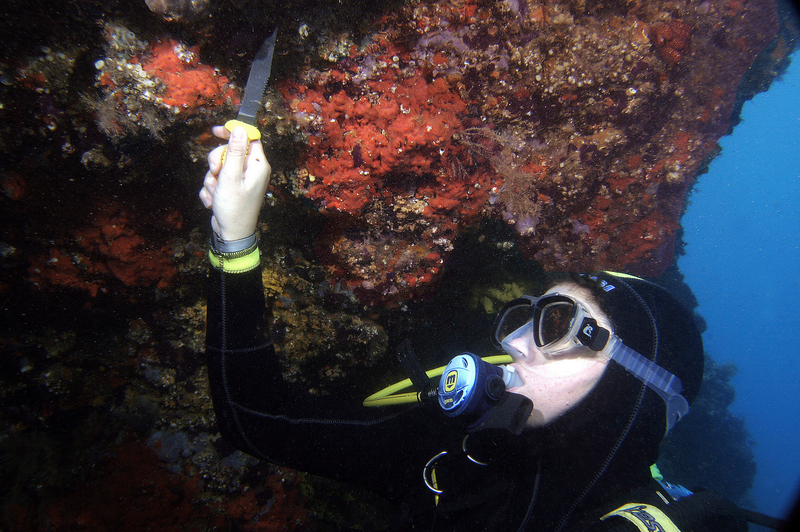 Dr Susanna Lopez-Legentil from spain, is sampling of tunicates in the Mediterranean sea in Spain at 30 feet deep. Bernard Banaigs who work with Dr S.Lopez-Legentil say: » Our interest lies in two main areas: – marine chemical ecology. The principal aim of this work is to understand why marine organisms produce such a wide array of interesting chemistry. – and marine pharmacology. 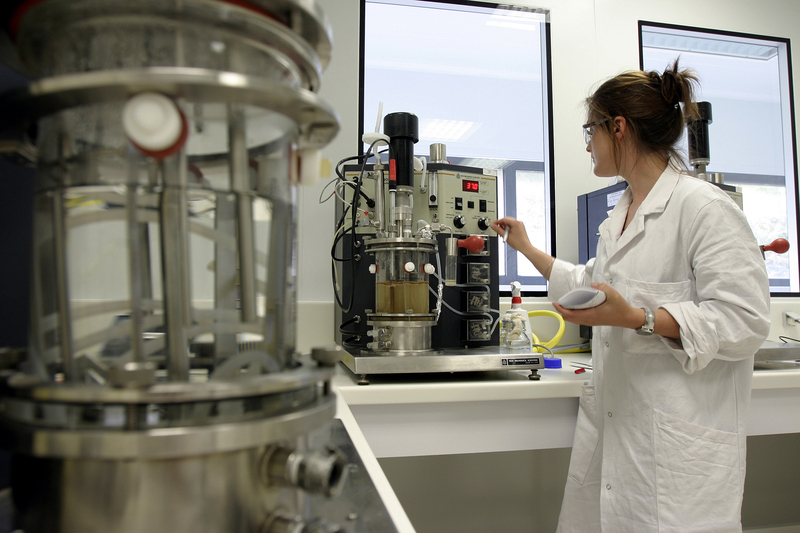 We are interested in the discovery of new pharmaceuticals from marine organisms ». Abalone. 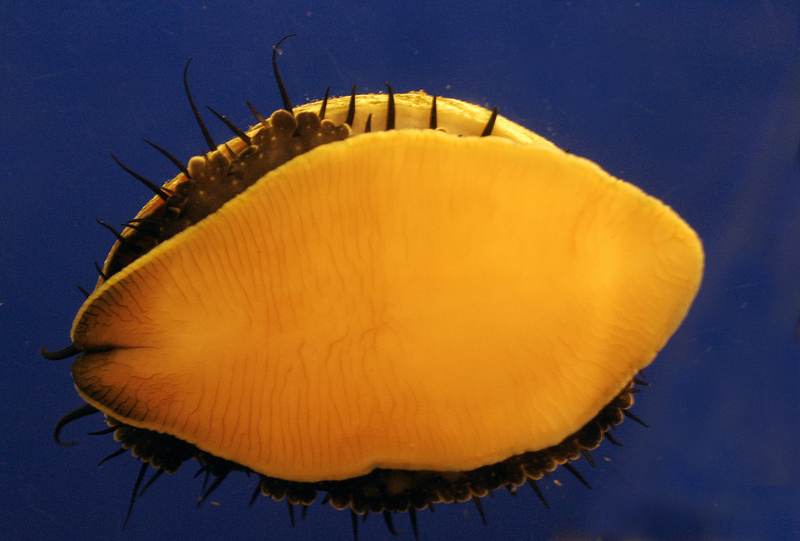 (Photo taken in an aquarium) Researchers are studying the molecules that regulate sperm and egg interactions in sea urchins and abalones to understand better how human cells work. Deciphering sperm and egg interactions at the cellular level in lower animals can unlock mysteries of cell interaction in higher animals. Such discoveries may be used to explain human disease processes with the hope of increasing our ability to prevent them. Understanding how sperm cells penetrate egg cells also can help scientists understand how disease-causing cells invade normal cells. 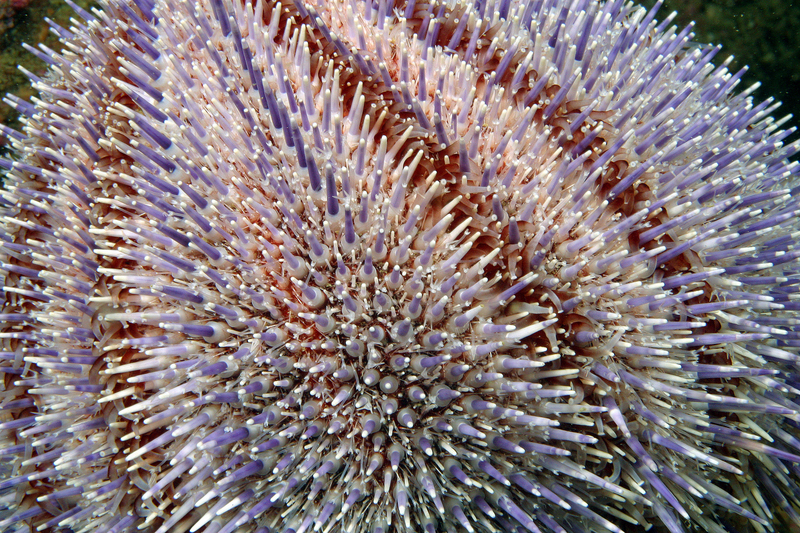 Edible sea-urchin . Photo taken in Bretany sea (France)Explaining Human Disease Processes Researchers are studying the molecules that regulate sperm and egg interactions in sea urchins and abalones to understand better how human cells work. Deciphering sperm and egg interactions at the cellular level in lower animals can unlock mysteries of cell interaction in higher animals. Such discoveries may be used to explain human disease processes with the hope of increasing our ability to prevent them. Understanding how sperm cells penetrate egg cells also can help scientists understand how disease-causing cells invade normal cells. Mediterranen sea. 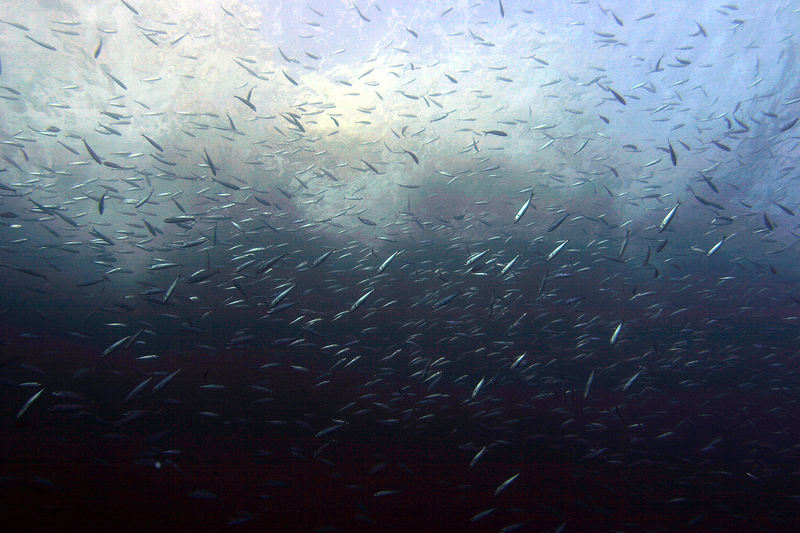 The Promise of the Sea.Illustration of sardines near the surface. Sky in the background. Dr Susanna López-Legentil, from Spain. observation of Cystodytes dellechiajei (tunicate) in the chemical laboratory at the University of Perpigan (France) This tunicate is a possible potentiel for drug medecine for the future. Interactions of all kinds, including chemical interactions, are a fundamental characteristic of nature. 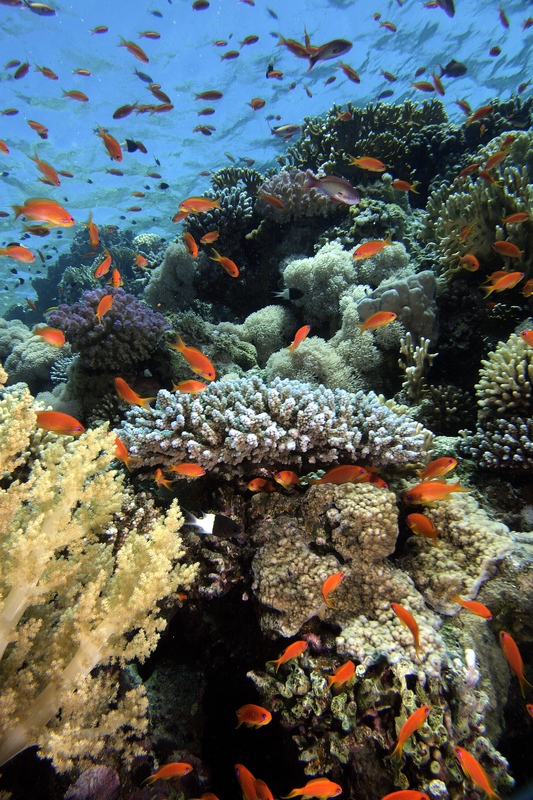 In the marine environment, interactions between organisms are mainly mediated by chemical communication. 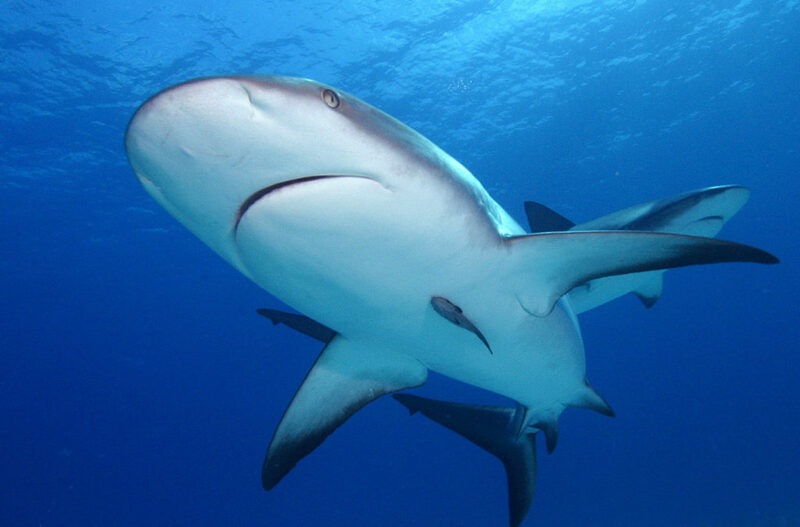 Although the natural function of most natural products remains uninvestigated, many of them have been demonstrated to serve as defenses against predators or competitors. 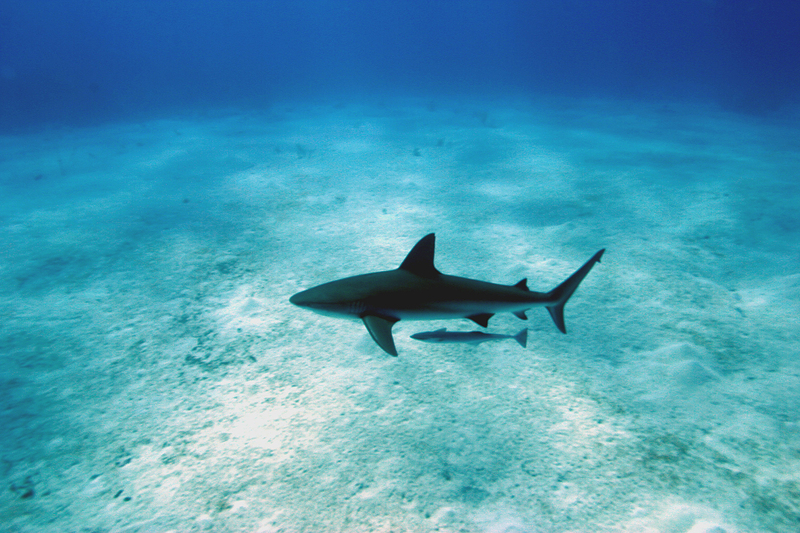 Investigations of biological and chemical ecological phenomena in the marine world contribute to a better understanding of marine habitats and also provide a more founded basis regarding the search for pharmaceutically useful marine natural products.